Even though his followers were all considerably older than the 14 year old Prem Rawat (Guru Maharaj Ji) when he first arrived in the West he was called "Father." It was expected and taught that premies would think of Rawat as their father no matter how incongruous or downright weird this seemed. Once Rawat's mother disowned and deposed him she was no longer to be considered Mata Ji, the Holy Mother but it was Rawat's wife in his new Holy Family who was to be Durga Mata Ji the mother of all the premies which was maybe even more incongruous and weirder. Could Prem Rawat ever stop being our Father? Durga Mata Ji: You and I are one, we're one heart loving our Lord and now He's joined us together in Him. I know this because I feel it so deeply and I know Guru Maharaj Ji loves you so much, more than I could ever, ever tell you and also in this marriage He's made me your new mother. And even though I'm a new mother. I I really don't know how to be your mother. But it's the child, the children that make a mother, a mother. Guru Maharaj Ji: I mean it's so amazing. If you, if you if you have ever walked with a little bitty child he holds on to that finger and he holds on tight and it's like he's looking around and he's laughing and he's smiling and he has one finger, he says "You know I want that balloon or I want that toy, you know, I mean it's like that, he's very, very hard, he's very, very firmly holding on to that finger and the father takes him on through that big place where he could have gotten lost like in a second. But because he is holding on to that finger, he does not get lost. And it's so beautiful. Durga Mata Ji: And all this mother has to say is that every child should listen to their father. Because their father is only telling them what is the very best for them. Because He knows. 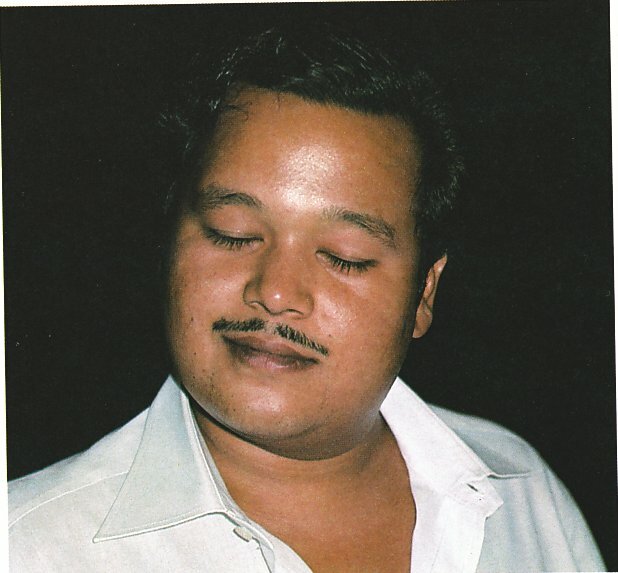 He knows exactly what each one of you need and so whatever Maharaji tells you, this is what you should do because then it will be absolutely perfect for all of us. Guru Maharaj Ji: And in this world we come, where there is so much illusion, and so much delusion, and we completely get lost. And here comes our Father, and says, "Hey, sonny, here. Hold on to my finger." You know and if you can just hold on tight, there is nothing, there is nothing in this whole world that can detach you, that can put you back into the same illusion where you started from. But only if you can hold on to that finger. Durga Mata Ji: So this is what we, we must remember always because our Father know exactly what we need and He's taking us, He's given you the key to the kingdom of heaven and it's up to you to open that door and to walk in. Guru Maharaj Ji: And so it's like, this Knowledge and the Grace, you know, and the satsang and the darshan is like that finger and if every premie can hold on to it - the meditation, the Knowledge, the satsang, the darshan - then the whole thing is just so beautiful because there is really no way left. Durga Mata Ji: And I know by Maharaji's Grace that we're really going to be the most beautiful family and soon this whole world will be one family. The way that it really should be. I remember Guru Maharaj Ji said something a few years back. 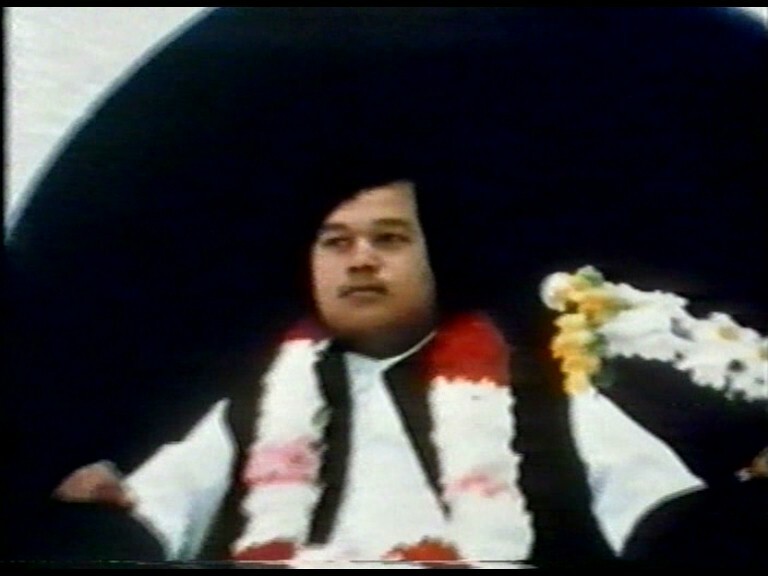 In 1972 he gave a very strong satsang at a festival where he said things are so bad in this world that if God is really, truly our father, our creator; and he's watching and we're all his children; and things have got to the point where we have the capacity to literally, to completely annihilate life on this planet, don't you think that if he's the father, he's going to do something about it? Isn't he going to take some measure to make sure that that's not going to happen? And in fact, Guru Maharaj Ji stated at the time that he already has. "You are really blessed that you have come to the door of our father. Let thy hearts be purified with tears of repentance and your body, mind and spirit full of devotion to his supremest lotus feet. 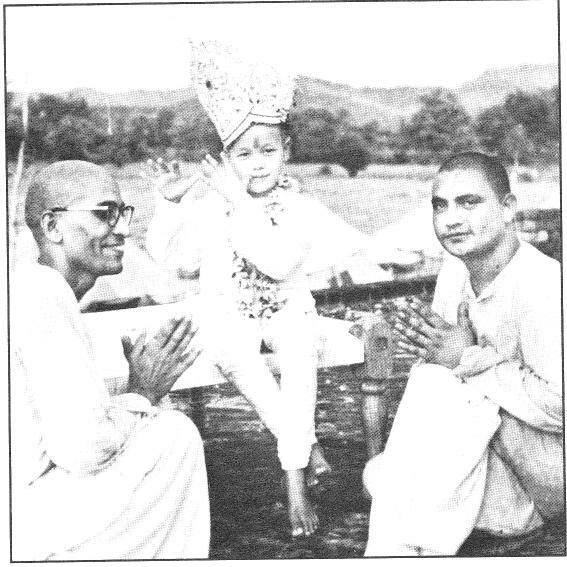 "Your humble servant in the lotus feet, Mahatma Padarthanand Ji." Guru Maharaj Ji's satsang in Orland, Florida on November 9th, 1975. You know we really don't have to be afraid any more. Because Guru Maharaj Ji is here, and he is our father. Guru Maharaj Ji is our Father. Each one of us is Maharaj Ji's child, his very own special child. We're his babies. Now he has come, he is our Father, and he is here. He is here to save us, because each one of us is so hungry and so thirsty for that love that he has to give us. Guru Maharaj Ji has clearly shown that he is our Father. There is only one Father, and this Father is the Source. There are no other Guru Maharaj Ji's; there is only one Guru Maharaj Ji. There are no other Gurus, there is no one else to follow. Bob Mishler: Guru Maharaj Ji is our father and we're all brothers and sisters. We are all his kids and we have to learn to get it on together. It takes a while to work it all out and that is the job of Divine United Organization. 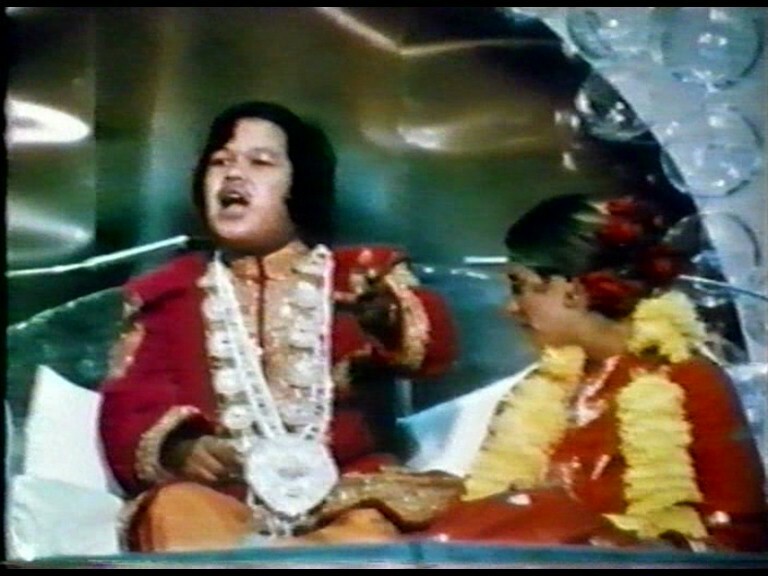 Durga Ji's Satsang Jhumri Talanja, in Bihar, India, April 19, 1975: Each one of us is Maharaj Ji's child, his very own special child. We're his babies. Now he has come, he is our Father, and he is here. He is here to save us, because each one of us is so hungry and so thirsty for that love that he has to give us. Durga Ji 11-10-78 Hans Jayanti: You know we really don't have to be afraid any more. Because Guru Maharaj Ji is here, and he is our father. Premie Satsang: He is pure in love, pure in faith. He is the only one who has unshakable faith in the power of love. He sees what we truly are and can bring us to be what we truly are. He is our Father, here to bring us to our true home. Guru Maharaj Ji / Boulder, Colorado / August 28, 1971: [God] saw that all the people were suffering. He couldn't bear that. For we are His sons and He is our Father, and it is impossible for our Father to bear it when we are suffering. And He came onto this Earth to protect us. 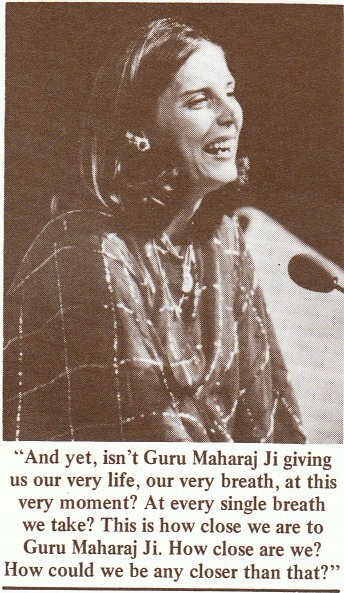 Durga Ji's Satsang at Guru Puja, Geneva 10th September 1978: None of us could ever take care of ourselves the way Guru Maharaj Ji takes care of us. Can any of us say that Guru Maharaj Ji doesn't take care of us? That he doesn't give us everything, everything we need, and even more than that, even what we want? It's just really too much. Because he is our father. 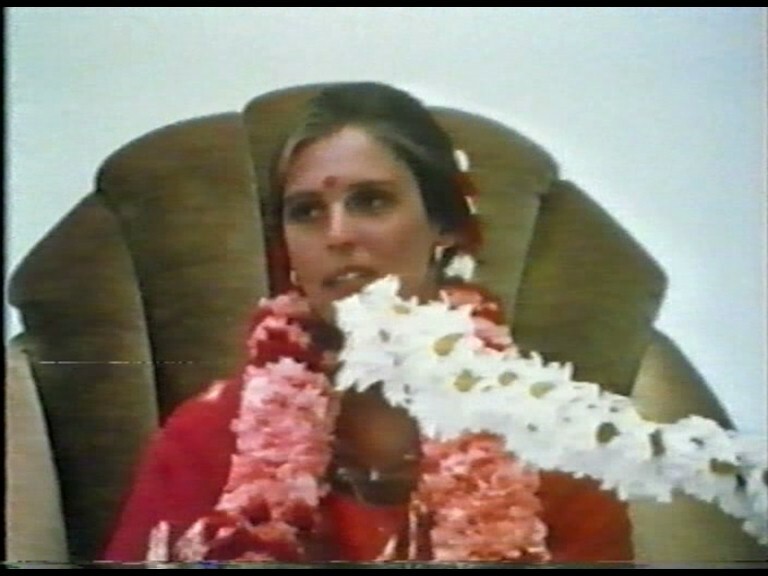 Julie Collett: If we think Maharaj Ji is our Master, is our Father, is in our hearts, we have to accept that Maharaj Ji knows where we are and what we need. To have Maharaj Ji give us what we need makes everyone of us, wherever we are, the most fortunate person. Prem Rawat: God created sufferings. But He couldn't, He couldn't see, He couldn't bear, when He saw on this plane how the people were suffering. He Himself created suffering, but when He looked, when He peeped through, He saw that all the people were suffering. He couldn't bear that for we are His sons and He is our Father, and it is impossible for our Father to see that we are suffering and He came into this Earth to protect us. Marolyn Rawat: … now we have to understand that this world is our ashram because Guru Maharaj Ji is in the world. He is our father we have nothing to worry about so now we have the mood in the world, Ago where we have to go we have to do what we have to do, whatever way we want is fine. It was Rennie in the Lion's Den--Pauley Ballroom. Through the darkened windows behind him loomed Sproul Plaza, site of so many historic rallies, speeches, movements. In the foreground, on a linen-draped altar, a huge blowup of Guru Maharaj-Ji, the divine child prodigy that Rennie believes is God the Father here to lead us all to salvation. He looks more like a young Oriental Mussolini. The Lord of the Universe. If you open your heart. We have no idea what kindness and mercy are, really. But I know that Guru Maharaj Ji is that embodiment of it, just as he is the embodiment of Love. And this is just what we have to realise: like Maharaj Ji said, going beyond just knowing it, but actually realising it, seeing the real reality of this life, and just knowing that that Giver and that Sustainer of our life is the embodiment of mercy, is the embodiment of kindness, is the embodiment of Love, is the embodiment of Grace, is the embodiment of Truth, is Guru Maharaj Ji. Our Father. Our Lord. But I can tell you what I know for sure. Guru Maharaj Ji is the embodiment of that love that is within us. He is the giver of love. He knows us in the deepest way that we can be known. He loves and sees us in a way that we could never love or see ourselves or one another. He is pure in love, pure in faith. He is the only one who has unshakable faith in the power of love. He sees what we truly are and can bring us to be what we truly are. He is our Father, here to bring us to our true home. Boulder, Colorad, August 28, 1971 And so, even now a Holy Master has come here to give you something. If you want something from me, I can give it to you. Krishna says, "Receive this Knowledge, by all means, but have a guileless heart. Have a heart filled with a keen desire to know it, filled with real love to know it." God created sufferings. But He couldn't bear it when He saw how the people were suffering on this plane. He Himself created suffering, but when He looked, when He peeped through, He saw that all the people were suffering. He couldn't bear that. For we are His sons and He is our Father, and it is impossible for our Father to bear it when we are suffering. And He came onto this Earth to protect us.